I don’t give much thought to black glutinous rice. The word ‘rice’ immediately make me think of a hot bowl of white or brown rice to eat with side dishes. But there are so many types of rice grains out there with interesting flavours and amazing health benefits. When I was trying to add more colours into my diet, I found and paid more attention to this rice. Try to think of food with blue or purple colour. Hard isn’t it? 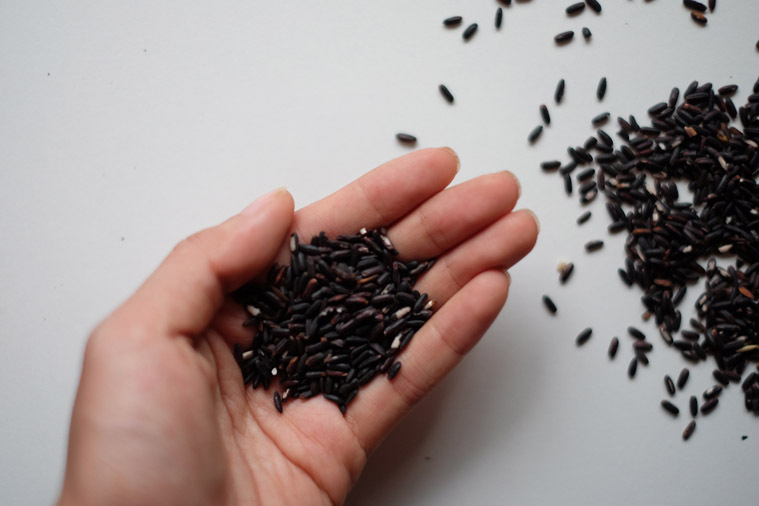 Although this rice is named black rice, when washed and cooked, it produces a deep purple shade. What’s amazing is that this inexpensive grain contains more antioxidant than pricey blueberries! This discovery lighted me up; it shows that eating healthy doesn’t have to be costly. Don’t be fooled by its name. Black glutinous rice is gluten-free and is not sweet. It has a mild, nutty flavour with intensifies when it’s dry roasted. The word black and purple glutinous rice is used interchangeably. Store in a dark, cool and dry place. Grains that are unopened, packed and stored properly can keep almost indefinitely (in simple term: for a very long time). It would deteriorate once exposed to air and pests. So do keep the grains in an airtight container. Do not introduce moisture into it; make sure your hands and utensils are dry when handling it. Glutinous rice is unrefined; it contains a bran layer (which contains oil and can go rancid). So it has shorter shelf life than refined white rice.